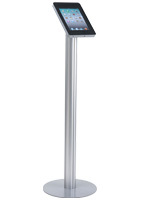 This silver iPad Pro floor stand combines top-notch security with an attractive modern design. 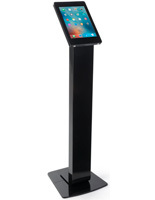 Made with heavy duty aluminum and powder coated in a pleasing finish, this kiosk prominently displays the stored tablet for customers to easily access. 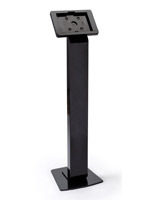 While many models in the market are not built for charging, this metal floor stand includes a built-in power strip to keep electronics charged while in use. 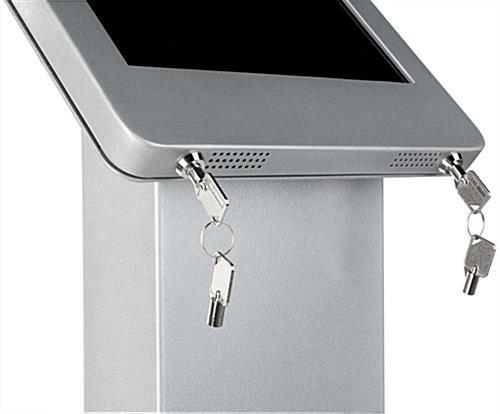 To prevent theft, both the back compartment and the tablet enclosure securely lock in place for security and peace-of-mind. 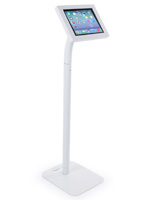 The slim frame on this unit provides a full viewing area, yet still covers the home button to prevent tampering. 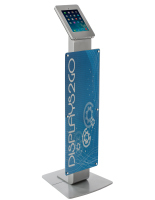 As well, during assembly, either a portrait or landscape orientation can be installed for the optimal display angle. 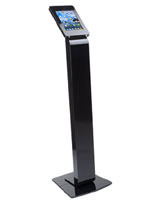 Designed for heavy duty use in high-traffic areas, this floor stand works great as a digital display of products, an interactive information kiosk, or as a sign-in booth for major events. We tried to use a regular iPad in an iPad holder and it was very unsuccessful. This unit is sturdy and holds our new iPad-Pro very well. 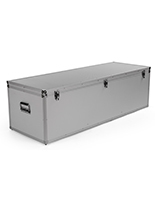 Sturdy base and fully self contained. 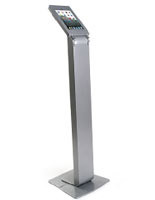 The neighboring cities are looking at our IPRO and are thinking about buying a system like ours! Great order department too! Only suggestion is to (Consumer) to purchase a faster shipping method. But that is on me. However, it was honestly worth the wait! Wow, it looks awesome, Craig! Thanks so much for sending us your thoughts and this photo! We love seeing how customers are using our products. We hope you shop with us again soon! Great Stand and Excellent Quality. 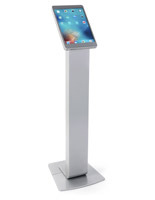 I am very happy with my new kiosk stand. It feels very sturdy and looks to be built very well. The finish seems to be durable and even and looks great in our showroom. The rear locking panel with the power bar inside is a great touch. Will be purchasing again. Thank you for your feedback, Jason, and thank you in advance for your repeat business! We hope to hear from you again soon.